They are the living connection to the war experience. For the National WWII Museum and its visitors, the WWII veterans who volunteer their time, sharing memories and insights, are golden. But those who can still donate their time are dwindling in number as their celebrated generation gradually fades from the scene. Only one of every 16 Americans who served is still living. 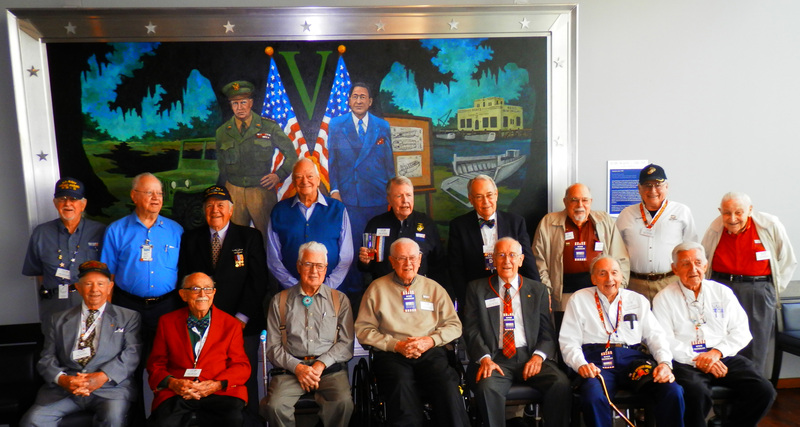 Standing in front of a George Rodrigue painting of two World War II icons, Dwight D. Eisenhower and New Orleans boat-builder Andrew Higgins, were, back row, left to right: Andrew Konnerth, Jimmy Dubuisson, Dutch Prager, Gene Geisert, Ross Gamble, Bob Wolf, Tommy Godchaux, Dan Cantor and Jimmy Fried. Those seated, left to right, were: C. Johnny Difatta, Lloyd Campo, Bill Cassady, John Rogers, Bowdre Mc Dowell, John Capretto and Jerry Gervais. The Museum salutes these special volunteers and all they represent!